But anyway, I decided to take on the extremely hard task of choosing my favourite 5 concerts I’ve ever been to, which was indeed a challenge because I love concerts so much and picking just 5 was tough. Nevertheless, I have chosen, so here we go… in no particular order, of course. Now, unless you’ve been living under a rock or know absolutely nothing about me, you’ll know I’m a tiny bit obsessed (understatement of the century) with One Direction. I could’ve very easily made my top 5 concerts just One Direction concerts, but I thought that was a little unfair and biased, so I decided to just let them take up one space in my top 5. Although every one of their concerts I’ve been to has been one of the best nights of my life, I chose On The Road Again in Cardiff because it truly gave me the best overall experience I could’ve asked for. I queued up with my friends outside the arena for about 7 hours (I’m not crazy I swear) and it was actually really fun, despite it being absolutely freezing cold. It really built up the hype for the concert being among so many people just waiting for the gates to open and hoping that you’re going to be lucky enough to be somewhat close to the front. When the gates finally opened, me and my friend lost our other two friends in the flurry (or should I say stampede) of people running, despite the threatening shouts from the security guards, into the stadium. Probably one of the most amazing feelings of my life was rushing into the stadium to see our friends at the barrier of our section. That’s right, they’d bagged us front row! I literally couldn’t believe it, I still can’t to this day to be honest. Once I’d grabbed that barrier I don’t think I let go for the entire time I was stood in that stadium. The concert was truly one of the best nights of my life, we were insanely close to the boys and it literally just felt like a dream. They had so much energy, as always, and sung their hearts out. They always give their fans the best shows we could ask for and this being the first time I’d seen them live since Zayn left, I was a little nervous as to how they’d be and sound, but to be honest their vocals were better than I ever remembered them to be, and they still had the same, if not more, enthusiasm and energy thrown into every song and everything they said to the 60,000 strong crowd. I know people have mixed opinions on Taylor Swift but personally I have loved her since 2008, and for me she is an amazing and inspiring person and has been my role model since I was about 14. I genuinely believe that anyone who says they ‘hate’ her needs to go to one of her concerts and then try to tell me their opinion hasn’t changed. This concert literally changed my life, I’m not even exaggerating. I’ve waited so long to finally see Taylor live and I was so happy when I got tickets to this tour! When we got there we got to our seats and I freaked out a little (maybe a lot) that our seats were really, really high up because I’m so scared of heights! But I soon got used to it and once Taylor came on stage none of that even mattered because my queen was right there in the same room as me. We all had little wristbands on our seats that we put on and it was genuinely one of the most beautiful things I’ve ever seen when they all lit up different colours, flashing on and off and from one colour to another to the beat of the songs, honestly it was one of the coolest and most amazing things I’ve seen. Taylor has such amazing stage presence, when she came on the cheers seemed like they would never stop! In terms of the show she put on, it was hands down one of the best concerts ever. She had a catwalk down through the crowd which lifted up and spun around while she sang and had dancers on it, and lifted up at one end so that she was level with some of the crowd as she sang a beautiful acoustic song. She had so many outfit changes it was astonishing and the dancers and props she used were incredible. The thing that has stuck with me the most from that concert, though, was one of the speeches she made before singing ‘Clean’, which was already one of my favourite songs. She said that all too often we compare ourselves to other people, and make ourselves feel like we’re not as pretty or as good as them. She said that we need to stop telling ourselves that we aren’t special or pretty or any of those things we tell ourselves we aren’t, and start focusing on what we are – ‘you are your own definition of beautiful and worthwhile’. I still get goosebumps remembering that moment, and as she poured out all these reassuring words the tears came streaming down my face, that is literally the most I’ve ever cried at a concert. I just stood there full on sobbing because coming from a role model I’ve had since I was in my early teens, to be told that I’m beautiful and I’m worth it and that I should stop comparing myself to others, something which I’ve done all my life, meant more to me than I can even explain. If you had been in that arena, all those people fallen completely silent just listening to Taylor say those inspirational words, you would not ever say a word against her again, because it was truly the most touching moment of my life, and that’s why this concert was so special for me and will always have a place in my heart. When I was 13 until I was about 16 or so, I was full on obsessed with the Jonas Brothers. Like, to the extent that I love One Direction now. They were my favourite band and the loves of my life, and don’t even talk to me about when they broke up okay, just don’t do it. Anyway, I was beyond excited and overjoyed when I got to see them live the day after my 15th birthday. When we first got into the arena, we were quite far away. But not long before the concert started some people came up to us and told us that our seats had been upgraded and it was honestly the best moment of my life! 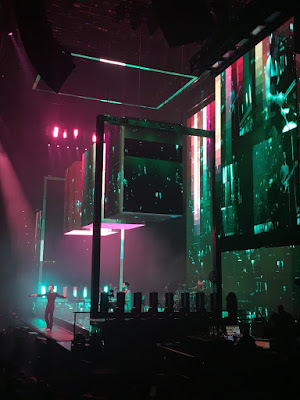 It was one of the coolest staging layouts I’d seen – the stage was in the middle of the arena and it was round, so wherever you sat you had a pretty good view of the stage. However, we got moved from the very right corner of the arena to the block directly in line with the stage, and our seats even had cup holders, which I was very amused and excited by. When the concert started I was literally beside myself with excitement, and the already really cool stage became even cooler because it turned round and round so that the audience got a good view wherever they sat, which was really creative and amazing, and I’ve never seen it done before that or since then! Also, the central part of the stage would lift up and down so that instruments such as a drum kit and a piano could be put onto the stage without having to move them on and off, they’d just disappear into the stage and another would pop up in its place. Pretty cool. This only being the second concert I’d ever been to and the Jonas Brothers being my first full on band obsession, it definitely deserved a place in my top 5. Unfortunately I can't seem to find any photos of this concert because they were taken on a really old phone that has long gone, but here's a photo of my ticket and t shirt! Olly is another one of my favourite artists and this was the first time I saw him live so it was really amazing! Our seats were on the floor at the other end of the row to the B stage, so we were really close to that which was really cool. What was even more amazing, though, was that in between two songs, Olly went off the main stage and nobody really knew where he had gone. There was an intro video to his song ‘Busy’ playing on the big screens, and then out of nowhere he came in through the side door and started singing, walking down the aisle right next to us! I was right on the very end of the row and I just remember security guards literally forming a human barrier next to us and the whole row of people pushing against them to try to grab Olly, it was insane! He was literally about a metre away from me, if that, and I tried my hardest to reach out to him as he was high fiving loads of people down the aisle but I’ll forever hate my really short arms for just not quite being able to touch him! Then he ran onto the B stage and carried on singing, and I was left wondering if I had dreamt that moment for a long time! Because of that, ‘Busy’ will forever be one of my favourite songs ever, it brings back so many happy memories and makes me smile so much. Olly has so much energy on stage and he is so down to earth, I’ve seen him quite a lot of times since the first time and he always puts on the best show and interacts with the crowd loads and is just genuinely funny and so entertaining, if you get the chance I would definitely recommend seeing him live if you haven’t already, his shows are fab! Now, last but not least, we come to McBusted. When I got tickets to this tour my inner 8 year old was screaming so hard, it was literally like reliving my childhood! That’s why I thought it deserved a place in my top 5, because McFly and Busted were two of my favourite bands growing up and to see them both together live was beyond my wildest dreams! Plus, the show was really, really amazing. It was really creatively and impressively staged and set up. It started by showing a video in ‘Back to the Future’ style, of them going back in time in the car to when Busted broke up, and then them teleporting to the future and forming McBusted, and then an actual replica of the car from Back to the Future came down from the ceiling and onto the stage and they jumped out of it and started singing, it was so fab! There were video clips joining up the whole show, and I thought it was a really cool way to connect all the songs, really original and not like anything I’d seen before. One of the coolest parts of the show though was when a circular spaceship-like thing in the middle of the arena started coming down from the ceiling with them standing on it, and they played a few songs on that stage above the crowd which looked amazing! I loved that they did a mixture of Busted and McFly songs, and it took me right back to singing and dancing along to them at the primary school disco. It really was one of the most original and impressive shows in terms of staging that I’ve ever seen, and so it definitely deserved to be in my top 5. So there you have it, my top 5! I feel really bad that I had to leave out some amazing concerts, like seeing Ariana Grande for the first time last year and all the incredible Lawson concerts I’ve been to, but I tried to pick my favourites when taking every aspect of the show into consideration so I couldn’t pick all of them! I do genuinely adore every single concert I go to, though, no matter who it is I just love letting go and escaping the real world for a few hours and enjoying great music, it really is one of my favourite feelings in the world and hopefully there’ll be many more moments like that to come!